These first bikes are from late 1981 through 1983/4. Steve Cook convinced Charlie that people might want to buy the bikes that he had been making for himself, but Steve ended up with production number 2 while his brother ended up with number 1. The fact that people don't get the point about this bike is evidence of its success. When Charlie made his bikes there were radical and he had an amazing amount of pushback from the early pioneers and early pioneering companies. Later he worked with Trek, Cannondale and Specialized, among other in the areas of frame design, materials and component design. His first personal designs were too radical for customers so the early customer bikes were "dumbed-down" until the reputation of the bikes caught on. His bikes are a lot more like the French constructeur bikes than is typical for other builders. Easy to have nearly every part be a Cunningham design or modification. And if you have a Cunningham and are not riding it, you are missing out. Some of the best riding bikes out there. Dialed geometry and more subtly, everything is dialed to work well together and you can feel it. Drivetrain on my Cunningham is smoother than on my XTR equipped MootoX. Sorry mate. So hard to take your diatribe seriously when you can't even spell your own bikes correctly. I had a nice chuckle though. Cheers! I think the welds are beautiful. Like a Rembrandt sketch. Heck if you've seen one double passed fish scale weld you've seen them all. There both of you happy now. I still think the bike is plain crap and ugly. But this does not still answer my question as to why this treasure of pleasure and the inspiration to the whole mountain bike world has not been snapped up by some indiana jones collector of inspiration or the national world museum for bicycles has not called the fellow scholars to buy this for there sanctum of cycling history. Maybe i'm ignorant and misguided, but i still await my answer to my question. Next you will be saying this is the holy grail of christ and you will put a jhad or whatever it is on my head for Blasphemy, and yes i googled Blasphemy just to make sure it was spelt in the way some people wish. As far as I know it was Russ Mahon of Cupertino, California (75 miles south of Marin County), who came up with this combination, in 1973. He grafted derailleurs onto a 1930s balloon0 tire bike built by the Cleveland Welding Company. He also put thumbshifters on this bike. Three Cupertino riders including Mahon showed up at a Cyclo-cross race in Marin, December 1974, pollinating Marin with these ideas. They then departed the scene for more than 20 years. yeah its not beutiful but i would defo have it in my collect. it was 5-6 years later that manufacturere stried making mtbs like that. I have a picture in a book i have "origins of dirt" i think where suntour came to see that bike to get ideas for there group set. grease ports, sealed bb etc. so a historic bike. Whether valuable, historically-important “things” should be in museums or in private hands has been debated for years. In the art world, I think most agree that you need both strong museums and strong private collectors active in the market for it to be healthy. For me, while bikes can be “art”, they aren’t like paintings, sculptures or photographs in that they are (also) designed to be USED (i.e., ridden). While it’s great that these museums have some of these important bikes, it’s also sad that they don’t get used. Some are in actually in a pretty poor state of repair and would require work before they could be ridden. I know that some here don’t like the comparison of bikes to the automotive world, but it’s apt in this case. I love events like the Goodwood Festival of Speed because it attracts truly top end entries from both the private collector and museum world... and they’re getting USED as intended. I’d prefer to see #1 get properly restored by Charlie and then get ridden by a new, loving owner who shares it with us all in photos, etc. The Mountain Bike Hall of Fame already have an early Cunningham and I expect their are others in captivity. As far as I know it was Russ Mahon of Cupertino, California (75 miles south of Marin County), who came up with this combination, in 1973. He grafted derailleurs onto a 1930s balloon0 tire bike built by the Cleveland Welding Company. He also put thumbshifters on this bike. Three Cupertino riders including Mahon showed up at a Cyclo-cross race in Marin, December 1974, pollinating Marin with these ideas. 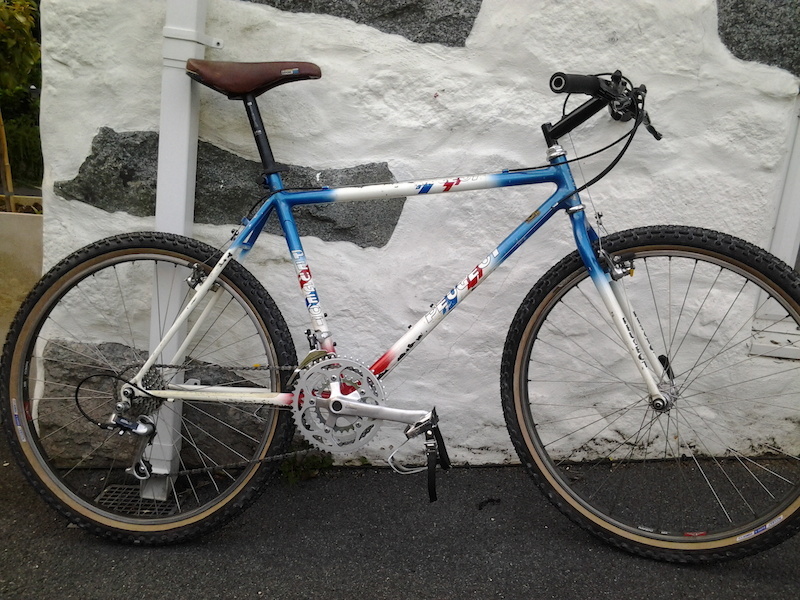 They then departed the scene for more than 20 years...."
The "multiple gears" are derailleur though the bike in the photo has the chain tensioner fitted under the bottom bracket. Does anyone know of an earlier "First fat-bike with a derailleur ridden off road?"